IAEP member Trevor Clark-Zamoider has been involved in EMS since he graduated high school, and in 2001 he officially obtained his EMT certification in Rhode Island, and later a Cardiac Certification. “I ran with several different departments and, like most, had calls I will always remember,” said Clark-Zamoider. Before learning about PTSD, he wrote off the night terrors, fatique, and depressive episodes he experienced as normal side effects of life in EMS. These symptoms put a strain on his personal relationships and brought him close to becoming a victim of suicide, but he showed up to work anyway. “Back then the view was that you are an EMT, so you can deal with it and move on. It was an unspoken rule not to let people know you were hurting or needed help,” said Clark-Zamoider. Clark-Zamoider put in hard work to overcome his barriers once he had the resources. “Only after I learned what some of my triggers were and was doing well with the medication was I able to return back to EMS full time," he said. Months later, Clark-Zamoider was matched with a service dog named Taylor. Taylor was trained specifically for the EMT, to help manage his unique set of symptoms and triggers. “He alerts me to wake from night terrors. If I shut down and stare off into space trapped in my thoughts he will paw at me to get my attention,” said Clark-Zamoider. Taylor is also trained to separate Clark-Zamoider from others if the EMT goes into a state of panic and to alert him if any signs of aggression are shown. 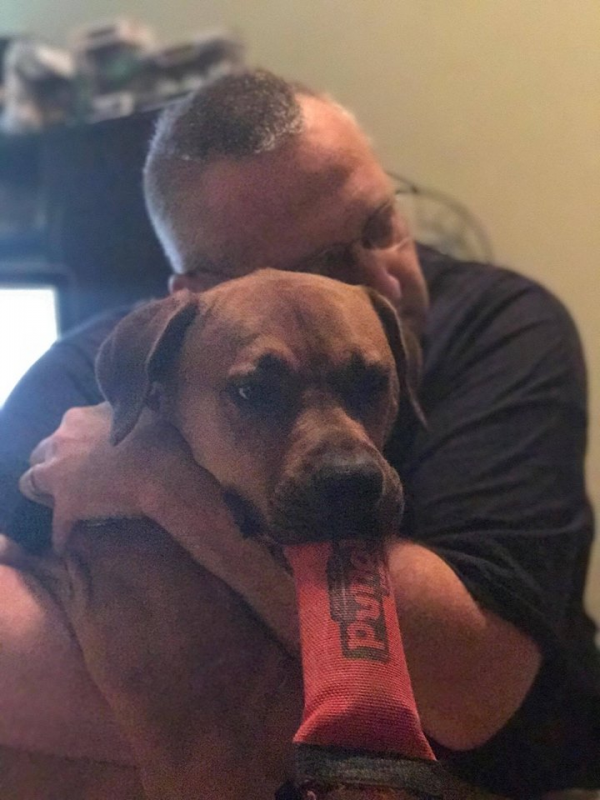 “He was trained to my specific triggers by an organization named Paws be Good that trains rescue dogs for PTSD veterans and first responders. This dog has literally saved my life,” said Clark-Zamoider. Although life was stable for Clark-Zamoider at the time, the process of managing PTSD is not always linear, and on September 30, 2017, an event disrupted his recovery. He awoke in the middle of the night to the sounds of a car accident right outside his bedroom window. He jumped out of bed, recognizing this wasn’t another night terror. He saw a grey vehicle with serious damage in the middle of the road, and telephone poles hanging nearby. Police arrived on scene and Clark-Zamoider assisted in immediate treatment of the female who was removed from the car. Clark-Zamoider has not only made a strong commitment to his PTSD management, but he also stepped into a role of advocacy. 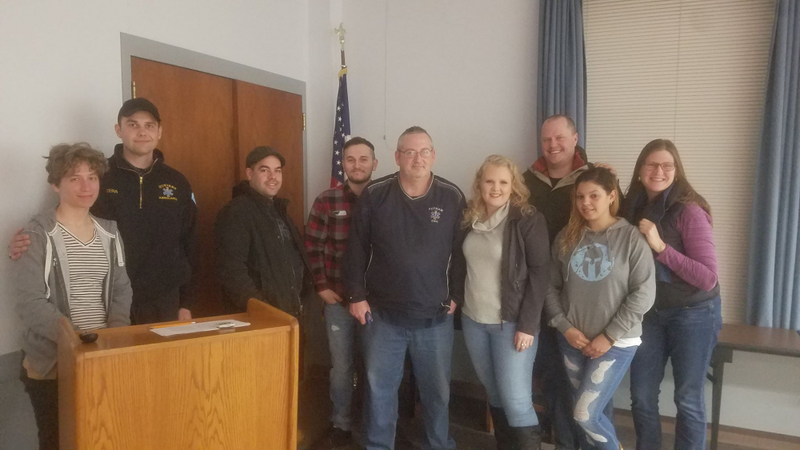 On Wednesday, March 13, 2019, with the support of his fellow union members, he spoke at a local library about PTSD and his experience with it through EMS. He is also actively communicating with IAEP leaders and policy makers in his state to ensure that the effect PTSD has on EMS professionals is an issue being represented in legislature. If you or someone you know needs help, visit codegreencampaign.org/resources. If you want to help end the stigma and raise awareness for first responder PTSD, you can donate to the Code Green Campaign through their website. Trevor Clark-Zamoider with his service dog, Taylor. IAEP members stand by Clark-Zamoider at his speaking event on his experience with PTSD in EMS.